From Memorial Day to Labor Day, my company offers us “summer Fridays” where I get to leave work at 1pm every single Friday. These half days are such a gift. In past years, I would take advantage of this early start to the weekend by making as many plans as possible. Take a trip one weekend, go on a jam-packed adventure with friends another week. If I didn’t have something to do, I felt uncool, almost as if I were less worthy as a person. Why does society perpetuate the stigma of being alone? There’s a general pressure, especially for women, to avoid being alone. Loneliness isn’t “becoming.” Blah, blah, blah. This negative view towards being alone and spending time by yourself, with yourself, does nothing but increase feelings of shame and cause an obsession with being busy, occupied. This year has taught me many lessons. One of the most important lessons I’ve learned is that it is not only okay, but necessary to spend time with yourself. This is an act of self care. The act of being with yourself, taking yourself out on a date, puts into practice the idea that you can be alone and also be okay. Spending time alone is not an easy task for me, so I challenged myself this year to use my summer Fridays as my “me” time. The farmers market is open down the street on Friday afternoons, so I like to take my time, walk around to all the booths, and compare the quality and pricing of the produce offered. Then, I start to plan potential meal options in my head for the weekend based on the fruits and vegetables that look best. I’ll have conversations with the farmers, who give me their recommendations. It’s really quite thrilling for me to do this! The produce is so incredibly, achingly beautiful to me. I’m passionate about home grown fruits and veggies, okay?! I made garlic toast with whole wheat sourdough bread I bought from the Iggy’s stand, and I enjoyed this dinner by myself, for myself. My heart felt happy and free. I also stopped by the Siena Farms stand in hopes that I would find squash blossoms. At first, I didn’t see any. Then, in a moment of pure serendipity, one of the farmers pulled out a bucket of them. I had my squee moment, then eagerly went up to him and asked for six. First, you’ll need to remove the pistil from the blossom (this is the part of the flower that gathers all the pollen). Gently open the blossom with you fingers and, with a pair of slender scissors or kitchen shears, snip off the pistil. Squash blossoms are delicate, so do not run them under the faucet! My suggestion is to fill a bowl with water and then place the squash blossoms in the bowl. This process gently washes them and helps get rid of excess pollen and dirt. Once washed, place the blossoms on a paper towel to dry. For the filling, place the ricotta, lemon zest, mint, and chili in a bowl. Mix together, then add salt and pepper to your taste. Fill a plastic bag with the ricotta filling. With kitchen shears, snip off a corner of the plastic bag. This will serve as your piping bag to fill the squash blossoms. Gently open your squash blooms and pipe the filling in. Don’t worry if filling overflows, it will get covered with tempura batter anyways! Then, in a separate bowl, add your flour, salt, and seltzer water. Mix together so the batter is thick (it should stick to your spoon). If the batter is too thin, add more flour. If too thick, add more seltzer. It’s quite simple! Before you do anything else, add canola oil (or the oil of your choosing, coconut oil/flaxseed oil/grapeseed oil will work, too) to your skillet and turn on the heat to medium high. You want the blossoms to sizzle when they hit the oil. Dip your squash blossoms into the tempura batter, coating all surfaces (but not too thickly). Once your oil is heated, place your squash blossoms in the oil. You’ll need to turn the blossoms a few times so that all sides are properly fried. Once the blossoms turn golden brown, take them out of the pan and place them onto a plate with a paper towel so any excess oil can drain. I encourage you to take time for yourself each day, and even schedule full days just for yourself. Recharge, honor yourself with a good meal sourced from the farmers market, read your favorite book, write, spend time outdoors. You’ll come to find that kind of solitude will leave you more open to the world, and the world will open itself up to you in return. Yesterday was the first day of spring, and it’s now…let me check my phone…26 degrees Fahrenheit here in Boston. We’ve all been craving the sunshine, the green grass, the blossoms, and the spring harvest. Winter brings us squash and citrus, but gosh do I miss those colorful farmers markets, those bright, fresh flavors. I needed a boost after being plunged into the cold for months, so I went to the grocery store and found fresh mint. One whiff of this beautiful herb brings images of summer to my mind’s eye. Right before I traveled to England in 2011 to study abroad in Oxford, I watched Jamie at Home every day. Jamie Oliver is one of my favorite chefs of all time for several reasons. He has a knack for pairing flavors together in the most beautifully simple way. The one flavor trio that stood out most was his use of lemon, mint, and chili. Look to his courgette salad recipe for an example of this. Mint and citrus are made for each other, and that extra kick at the end from the chili adds an unexpected warmth. Amazing. This past weekend my boyfriend and I ate dinner at The Haven, a Scottish pub in Jamaica Plain, MA. One of their signature sides is minty mushed peas. Oh my heavens. Chopped mint made those creamy peas the most refreshing mashed vegetable in the world. 1. Put the frozen peas in a pan. Take a garlic press and crush one clove of garlic, adding that garlic to the pan. 2. Add olive oil to the pan and turn the heat up to medium. Season the peas with salt and pepper to your taste. Let the peas sizzle in the pan until fully thawed. Turn off the heat and set aside. 3. Fill a large pot with water and heat until boiling. 4. As the pasta water heats up, wash the mint leaves and either chop them with a sharp knife or rip them into pieces with your fingers for less bruising. Add these mint leaves to a bowl along with the lemon zest and lemon juice. If you do not have a mortar and pestle (I don’t! ), take the back of a spoon and press or “muddle” the mint and lemon against the side of the bowl. This allows the juices in the mint to come out and mix more readily with the lemon juice. 5. Add the ricotta cheese to the mint and lemon and mix until fully incorporated. Add the cayenne pepper (or fresh red chili) and salt; mix until combined. Set aside. 6. When the water begins to boil, add the egg noodles and cook until al dente. 7. Add drained pasta back into the pot and mix with the sauteed peas and garlic. 8. 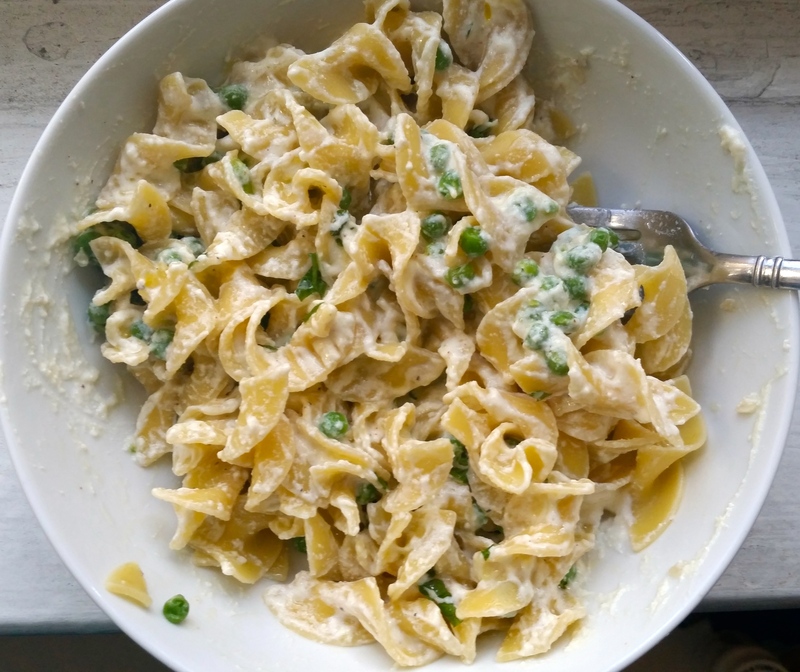 Spoon the pasta into bowls and top with the lemon mint ricotta cheese mixture. Mix it all together. And there you have it! A pasta dish so creamy yet so refreshing. Spring is here—celebrate with good food. Happy cooking!